From left, taters, tea, bacon and eggs. Not pictured: English muffins. Christmas Day was one chilly sonofabitch, with a nasty bit of wind, so naturally Herself and I decided to go out for a short run, reasoning that we could do anything, no matter how sucky, for a half hour. You will recall that I have “run” exactly once since May, while Herself pounds ground a couple days a week and did a half-marathon back in October. So imagine if you will an elderly, portly Irish setter chasing a young border collie over hill and dale. After such a massive caloric expenditure I felt compelled to prepare a pot of pre-Mexican hominy stew, and this morning topped that off with a mess of pan-fried potatoes, hickory-smoked bacon, eggs over easy, English muffins, coffee and tea. And now I feel slightly sluggish for some reason. Probably the bonk. I should eat something. This entry was posted on December 26, 2016 at 10:32 am and is filed under Cooking, Food, Holidays, Running. You can follow any responses to this entry through the RSS 2.0 feed. You can leave a response, or trackback from your own site. Lunch today will be turkey stew leftovers and a large salad. I have already gained my five winter pounds, and it ain’t even January. Starting tomorrow the weather is supposed to get real nice. The Niner, detailed, lubed and adjusted, waits for me. I’m gonna have to start logging some fat-burning miles pronto. A steel frameset can only take so much. PO’G: You’re quite the culinary maestro! Looks wonderful! Do you use any special pots/pans when creating your delights? Nope, JD, I laid hands on some inexpensive Emeril stainless pots and pans some years back and it’s held up pretty well. It was billed as “Emeril by All-Clad,” but I believe the Emeril-label bits were made in China instead of the USA. A little less burly and a whole lot cheaper. 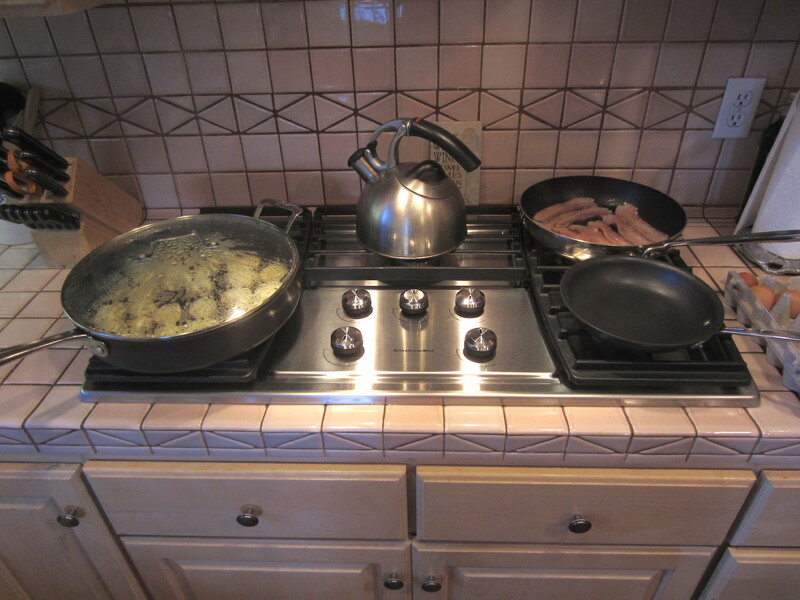 I have one made-in-USA All-Clad non-stick skillet, and I’d like to have a bunch of their stainless items. But it’s easy to spend a grand or more on a 10-piece set. One of these days I need to just break out the Visa card and get ‘er done. You should see the hodgepodge of cook ware in our kitchen anchored by a 10 1/2 inch Wagner Ware milled bottom, cast iron skillet that I bought at Sally’s Army in 1972 for 3 bucks. And, my carbon steel wok that Sandy gave me for Christmas in 1985 is still going strong. I think she was trying to tell me something about my proper place in the home. Solstice day-ish breakfast was much simpler. Half a challah drenched in french toast batter with too many eggs just for little old me. Then a nice 3 hour nap. Oddly the Buddha belly I lost between Chicago and Santa Monica has returned to its roost. Happy bottom of the solar cycle to everyone! We took on the holiday cooking duties for the fam-damiily out in Sunny Santa Barbara. The nieces showed up to help make ravioli on the 24th (crab, squash and ricotta were the three fillings) along with some tortellini with a lamb stuffing. On the 25th we roasted a couple of big chunks o’pork porchetta style, steamed some fresh green beans and whipped up a mixed salad to go with the ravioli and then let ’em all have at it. We washed it down with a 3-liter bottle of Italian red from Trader Giotto’s and finished the whole thing with Zio Lorenzo’s infamous tiramisu and a taste of Moscato d’Asti. PS-none of mom-in-law’s cookware is anything to write home about- it’s more fun to cook with high-quality tools (just as with wrenching on bikes) but it’s more the quality of the ingredients and not screwing them up that counts.